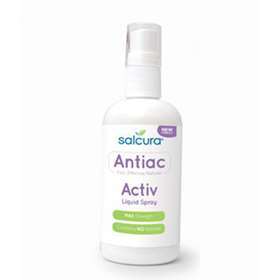 Salcura Antiac Activ Liquid Spray 50ml is an intensive skin therapy for the treatment of acne. It is formulated to clear breakouts of spots as well as deal with persistent, regular occurrences of moderate to severe acne, including blackheads, whiteheads, blemishes and pimples, cystic acne, pustules, papules, and nodules on the face and body. Salcura reject the use of harsh ingredients that can cause many people discomfort or severe drying of the skin, therefore this product is free from benzoyl peroxide, antibiotics, steroids, hormones, parabens, sulfates, alcohol and lanolin. Instead, Actiac Activ Liquid Spray sources its power through natural ingredients such as Sea Buckthorn - a 'super ingredient' which gently soothes inflammation, deeply cleanses the skin and targets infection. This is combined with eucalyptus to calm angry skin, naturally antibacterial manuka honey and soothing sandalwood to help overcome spots and leave your skin cleansed and clear. Fast acting, effective treatment for acne, blackheads, whiteheads and pimples. Free from benzoyl peroxide, antibiotics, alcohol, parabens, sulphates and lanolin. Contains sea buckthorn, manuka honey, eucalyptus and sandalwood. Cleanses, soothes inflammation and targets infection. Salcura Antiac spray is ideal for hard-to-reach areas such as the back and shoulders. Use morning and evening as required. After cleansing the skin, apply spray onto your hands or a cotton pad and massage gently into the affected areas so that it almost disappears into the skin. For best results, use this product alongside the Antiac Daily range. Aqua, glyceryl cocoate, hydrogenated coconut oil, helianthus annuus seed oil, lecithin, sodium cetearyl sulfate, cetearyl glucoside, polyglyceryl-3 caprylate, polyglyceryl-4 caprate, alcohol denat, zinc PCA, arginine, bisabolol, glyceryl laurate, p-Anisic acid, melaleuca alternifolia leaf oil, citrus aurantium dulcis peel oil, eucalpytus globulus leaf oil, lavandula angustifolia oil, rosmarinus officinalis leaf oil, leptospermum scoparium branch/leaf oil, mentha piperita oil, citrus aurantium amara flower oil, carthamus tinctorius seed oil, hippophae rhamnoides kernel extract, rosmarinus officinalis leaf extract, prunus amygdalus dulcis oil, olea europaea fruit oil, aloe barbadensis leaf juice powder, vitis vinifera seed ol, maris sal, isononyl isononanoate, ceteareth-25, cetearyl alcohol, beta-carotene, phenoxyethanol, ethylhexylglycerin, caprylyl glycol, limonene, linalool.